It was great to have the crusts on hand. 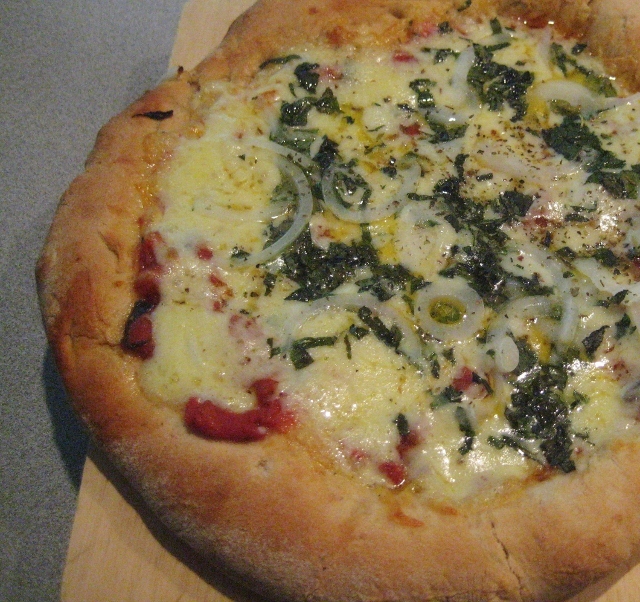 These were made with the bread machine pizza dough recipe from Day 23 but instead of making 4 thin crusts or 14 mini crusts I ended up with two nice thick crusts. Needless to say, we had plenty of leftovers! One item we don’t have leftover is okra. The rather limp uncooked okra that had been haunting me became the key player in a number of games yesterday at our family Labor Day Party. 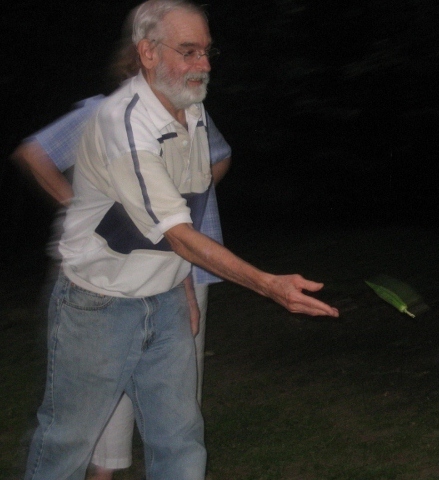 The most successful one was “The Okra Toss” where participants attempted to toss 4 okra pods into a bowl. Watch out – if you try this at home -they are very bouncy! Most of the other okra games devolved into pelting the other players with okra. Also fun! We are slightly concerned that our hostesses’ yard will become the home of many new okra plants next year! Another exciting piece of news is that our NC food co-op is offering ice cream! Home delivery of ice cream…it doesn’t get much better than that (okay, maybe making your own ice cream would be better) but I am thrilled!!! 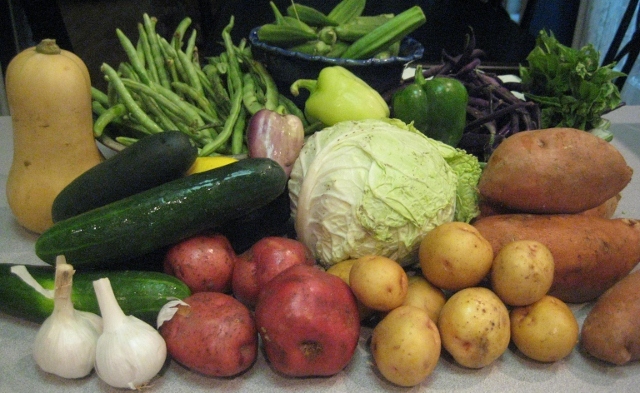 I spoke too soon about the produce box having all edible items – in the top center of the photograph, you will find a blue dish filled with a southern specialty that I’m not quite ready for…more on the veggie that should not be named later on (when I attempt to cook it). The presence of the okra (oops! I named it) was more than made up for by the discovery of the Royal Burgundy Bean. 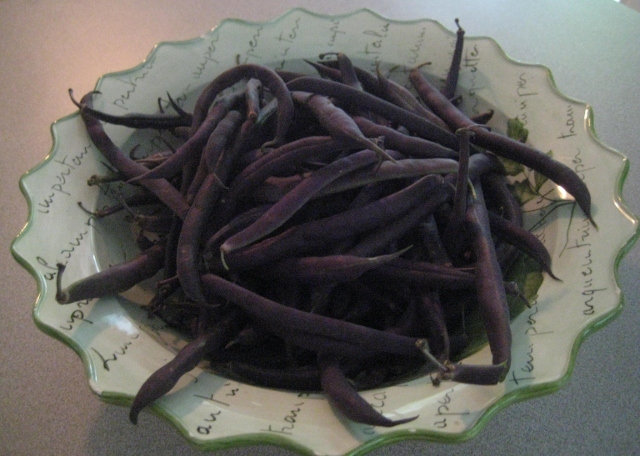 This stringless bush bean is simply beautiful – deep purple on the outside and green on the inside. They taste like regular green beans and worked well in the (not-so-locavore) green been casserole I made. The big surprise is the beans turn green when cooked – this is a considered a feature: “built in blanching indicator.” If I have gardening amnesia next year and do not re-read my posts about my lack of gardening ability, I might have to try growing these beans. Okay, I have to ask: any tips on cooking okra?